Big News Townies! Today we are announcing an expansion to Town of Salem! Town of Salem: The Coven. In this expansion we are introducing 15 new roles, a new faction, exclusive queues, rotating game modes, and tons of improvements to the current game. Hex Master – Master of the art of spell slinging whose attacks won’t take effect until all members of the town are hexed, then a devastating blow will be dealt. Poisoner – Poison is the trademark of this witch. A skilled herbalist with the knowledge to mix slow killing poisons that give her plenty of time to flee the scene. 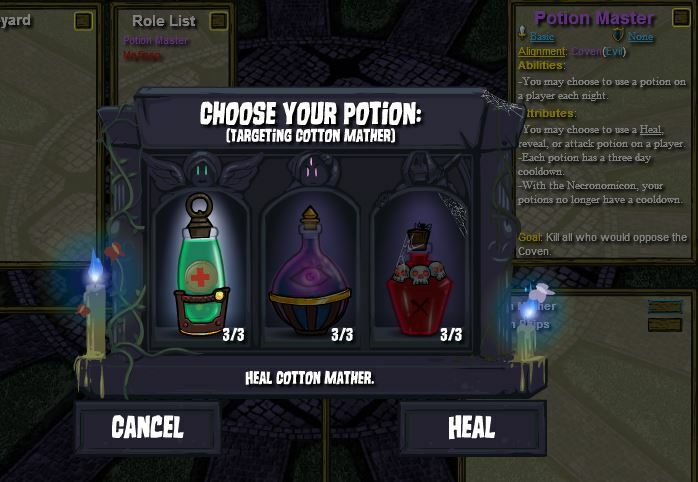 Potion Master – A powerful alchemist with the ability to heal, reveal, and attack a player! It will take time to brew your potions again, so choose wisely. Medusa – A snake haired monster gifted with a gaze that turns people to stone leaving no trace of who they were. Necromancer – A failed Retributionist scorned by the town, they use their powers to exact their revenge! Coven Leader – The Witch we all know and love has assembled a Coven of her own and uses her voodoo powers to lead the Coven to victory against all who would oppose them. Crusader – An overzealous protector whose ability to protect can easily backfire. Tracker – A woodsman with a talent for tracking those not wished to be tracked. Trapper – A silent protector whose traps can do more than just kill. Psychic – A gifted seer with the ability to find your darkest secrets. Ambusher – A stealthy killer who lies in wait to attack when least expected. Hypnotist – A skilled hypnotist who can alter the perception of others. Guardian Angel – Overlooking your charge, protecting them against harm, that is the life of a Guardian Angel. Pirate – Plundering booty, a Pirate’s life is full of danger when your wealth is stolen from others. Plaguebearer/Pestilence – A god among us the Plaguebearer is spreading disease to regain his powers as Pestilence, Horseman of the Apocalypse. Mystery role – This role will be a neutral killing role, so it will only show up if there is a Neutral Killing, Random Neutral, or Any slot in the game. This role will be super rare, so keep your eyes out for this super cool role! We will be implementing a set of rotating game modes that will change every so often. VIP Game Mode – We will be starting with our new VIP game mode. This game mode has a list of Town vs Coven with a few neutrals splashed in. The point of this mode is to protect, or kill the VIP depending on what side you are on. The VIP is a randomly selected Town member and gets revealed to all other Town members as the VIP. This means you start the game knowing at least one good player if you are Town! We think this mode will be a blast and create a fun new atmosphere and different style of play. Or it will create a terrifying sense of doom that sends you into a dark abyss. One or the other. Lovers Game Mode – This mode will have a normal role list as well and will link random players together in the game in the bonds of love. If your lover dies you will die as well. This mode forces you to question even confirmed teammates as the lovers can win even if their own faction loses. Will you ride off into the sunset, or will you die of heartbreak? 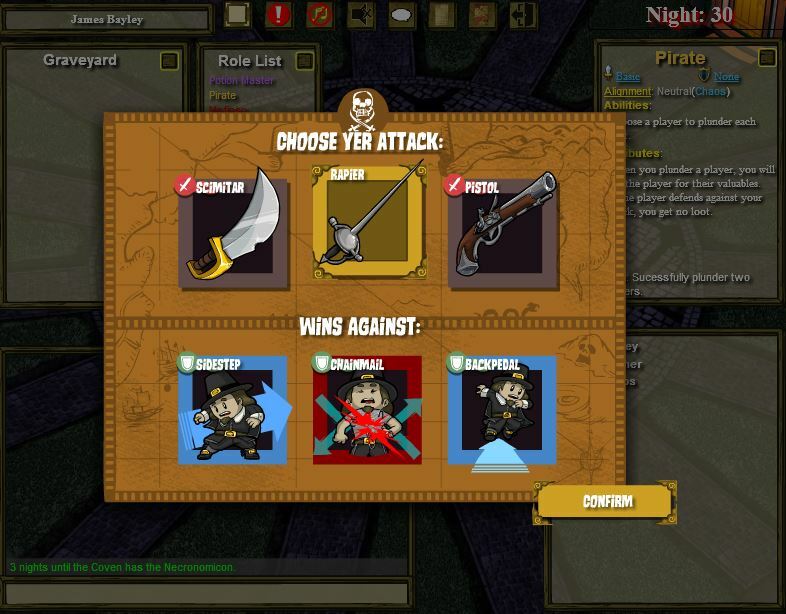 Rivals Game Mode – This game mode works in a similar fashion to the Lovers mode, but reversed. The rivals must make sure their rival is dead and they lived to the end of the game to win. This can be difficult as you want your rival to die, but you have to make sure that your team is already on the path to victory or you could end up losing the game. 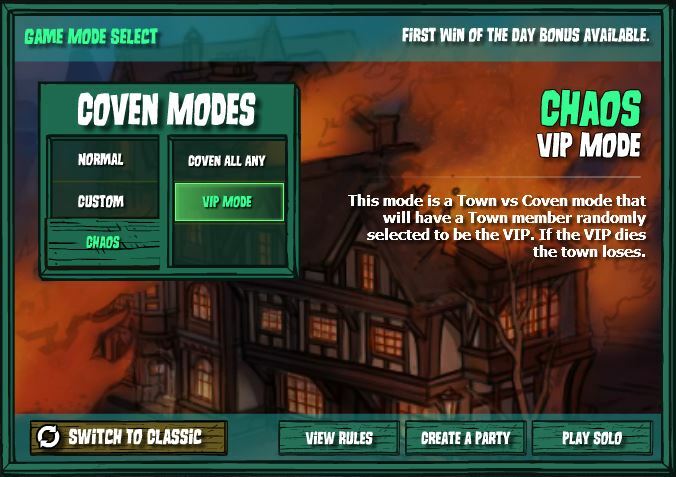 These rotating queues and all other Coven game modes will only be able if you are playing on Town of Salem: The Coven. We know the game can be confusing at times especially when we have things like night immunity, that doesn’t protect against night immunity piercing attacks, or having a doctor that protects against every attack except Arsonist attacks, etc. This lead us to create a keyword system that will completely change how role cards, abilities, attacks, and defenses are seen. We hope this system will clear up a ton of confusion in the game, and allow players to pick up, learn, and master the game much faster.